Before it becomes the finished article, the initial step in the process is developing a design for the sign with our customers. We provide our customers with a variety of lettering and emblem examples that they can use, but we welcome the customer’s personal sketch designs so as they can have their own input on the sign. 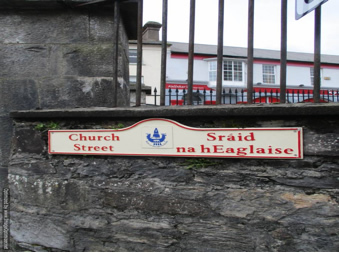 We are more than happy however to provide photos of our large range of emblems that can be used on the cast metal signs. The example sign made will be of a wooden pattern. 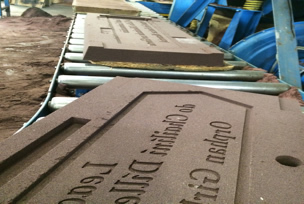 Each sign is individually laid out and the letters are set out within the pattern to the requirements of the customer. 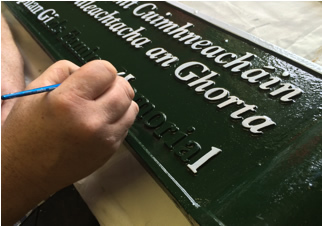 The copy of the sign will be the exact size of the finished article so as to give the customer a good understanding of how their product will look when completed. 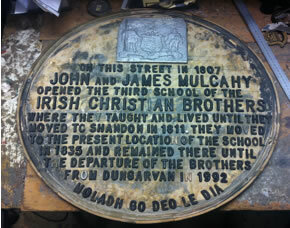 The next step is where a mould of the sign is made in the sand. All the containers vary in size depending on the sign being casted. 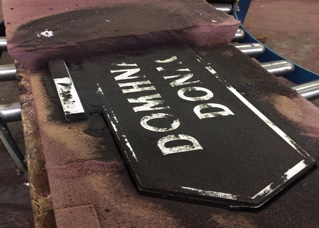 The sand takes about twenty minutes to solidify, and once this is achieved hot molten metal is then poured into the sign to produce the raw casting. This aluminium is heated at approximately 670 degrees Celsius in our foundry furnace. 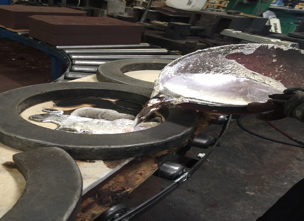 The furnace is given time to heat to the necessary temperature level where the aluminium is melted sufficiently, and then this metal is poured into the sign container to produce the raw casting. 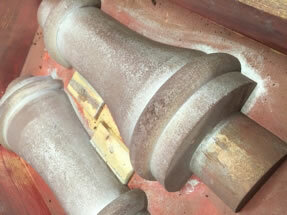 The aluminium is poured at a careful rate so as not to damage the mould. When the metal has cooled, the molds are broken to reveal the cast sign within. The sign is checked to ensure that it is of a satisfactory standard. The final stage of the process involves the painting of the sign. The sign is first baked and then polyester powder-coated to the customer’s desired colour. It is then hand-painted by in our in-house artist to a high standard finish. The sign is then either collected by or delivered to the customer. We deliver both in Ireland and internationally, with orders delivered by courier.